Brigitte, owner of LYS Klose Knit, recently asked if I could come up with a small, free pattern that could help promote the yarns in her new online shop. I’d been playing around with mobius crochet anyway and the project was made all the more appealing when Brigitte gave me a ball of Silky Merino to play with. What follows is a little tutorial/pattern for a lacy, crocheted, mobius cowl. We wanted to keep it to one skein, but it’s easily adaptable for different yardages, weights, and sizes. Begin with a “chainless” single crochet foundation. I chained 80, which gave me a cowl about 18″ in circumference, but any multiple of 4 will work for this stitch pattern. If you wanted to adapt this pattern for a shawl, measure around your shoulders not-too-loosely, not-too-tightly, and figure out the multiple of 4 chains that will give you the nearest fit. To make a chainless sc foundation, start by chaining 2. 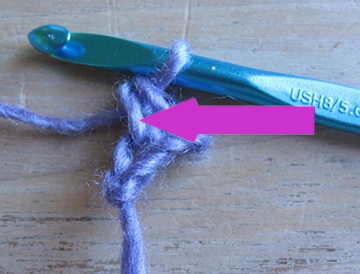 *yo and pull up a loop, yo and pull through both loops on the hook (in other words, work a single crochet stitch). See that loop with the big arrow pointed at it? Insert the hook there in the direction of the arrow and repeat from * until you’ve made whatever multiple-of-4 number of single crochets that you want. You should have a chain that looks like this. Row 1: Ch3 (turning ch), [2dc, 1 ch, 2 dc] in 5th ch from hook, *sk 3 ch, [2dc, 1 ch, 2dc] in next ch, rep from * to last 2 ch, sl st into trn ch to join. The only tricky thing is that as you’re working into the bottom of the chain, remember to insert the hook under two strands of yarn (one strand will stand out a bit more to tempt you, but go under both). Continue to work the pattern all the way around the chain. When you get back to the place where the two ends are joined, you should be situated to simply keep going, this time working into the top part of the chain. As you work across, work your new sts directly into the spaces created by the sts on the row below. This leaves nice lacy holes uninterrupted by any little strands of yarn. When you get back to the beginning (sorry–I didn’t get a photo of this step), join the two ends with a slip stitch, make your turning chain and turn, and work back in the same pattern. Keep going until your cowl is as long as you want it or until you run out of yarn. Thanks for the tutorial. Now I understand how to do the "chainless" sc foundation and have a lovely cowl to practice the technique with. got a good hang of it and it turned out very nice. added some personal touches! enjoyed the step by step instructions. thanks! Thank you so much for the chainless sc tutorial, I tried to learn it from another source but yours was much easier to understand! I am having a terrible time with rows after last photo in pattern. What are the instructions for row 3 until finished. M first 2 rows look great, but I need more instructions than “When you get back to the beginning (sorry–I didn’t get a photo of this step), join the two ends with a slip stitch, make your turning chain and turn, and work back in the same pattern. Keep going until your cowl is as long as you want it or until you run out of yarn.” When I turn and follow the pattern, the shells are in the wrong direction. Please help. Thank you so much for the fsc tutorial. I never could get this because I could not tell where to go after the first stitch, but that great big arrow definitely pointed the way for me! I agree with this comment. My solution after the slip stitch join was to slip stitch up to the first chain one space then my chain three for the first dc, then dc ch 2dc, in that chain three space, then 2dc ch 2dc in the next chain one space and one around. I believe that is going to give me the result We’re looking for. We’ll see.